This topic describes how to enable incremental data loading in RadListView. To enable incremental loading, you have to use as ItemsSource a collection that implements the ISupportIncrementalLoading interface. You can also take advantage of the IncrementalLoadingCollection which is our default implementation. 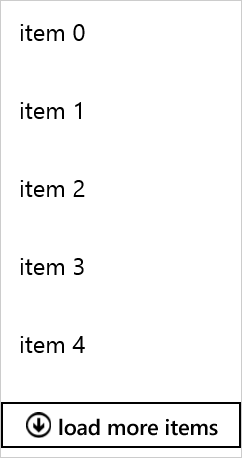 Automatic: Scrolling to the end of the control automatically loads more items. Explicit: The user has to explicitly request more items by click/tap on the button. The RadListView also supports LoadMoreDataCommand that by default is executed to load new data. You can find more information about the list view commands here. This example demonstrates how to use the incremental loading functionality.